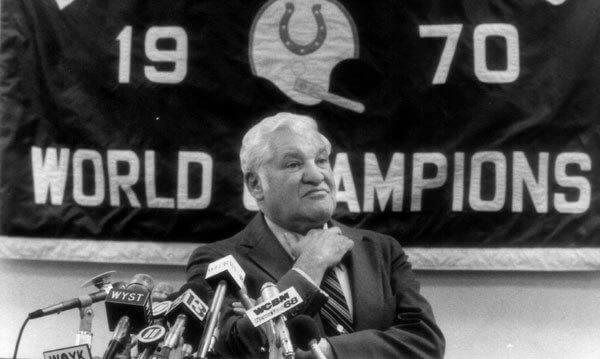 Rosenbloom traded the Colts franchise to Robert Irsay on July 13, 1972 and received the Los Angeles Rams in return. Under the new ownership, the Colts did not reach the postseason for three consecutive seasons after 1971, and after the 1972 season, starting quarterback and legend Johnny Unitas was traded to the San Diego Chargers. Irsay assumed ownership of the Baltimore Colts on July 13, 1972 after acquiring the Los Angeles Rams from the estate of Dan Reeves and swapping franchises with Carroll Rosenbloom, all made official on the same day. His last-minute US $19 million bid for the Rams was $2 million more than that of Hugh Culverhouse. Irsay’s majority share in the Colts was initially 51%, with Willard Keland of Racine, Wisconsin owning the rest. He additionally announced the appointment of Joe Thomas as Baltimore’s new general manager, succeeding Don Klosterman who accompanied Rosenbloom to Los Angeles.